An excellent opportunity to get a unique gift for Christmas. Browse a wide selection of goods: Art, Jewellery, Ceramics, Silk scarves, Crochet-work, Gaelic Cards, Home Furnishings, Photography, Body-shop, Plaques, Preserves plus lots more. A children’s Area with activities including making a Festive decoration. The Children’s Area is open from 11am -2pm. Suggested entry is £3 per child. 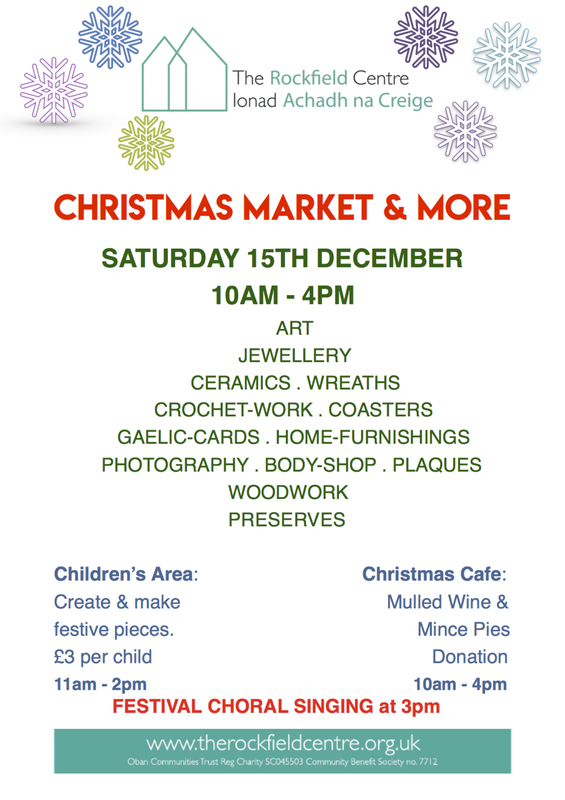 Christmas Cafe will serve Mulled Wine and home made Mince Pies - relax and enjoy the buzz. Donations welcome. The Oban Choir will entertain us with some Festive singing at 3pm. Join in the chorus of some well know songs.